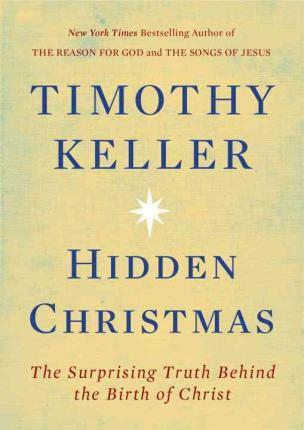 From pastor and New York Times bestselling author Timothy Keller comes the perfect gift for the Christmas holiday--a profoundly moving and intellectually provocative examination of the nativity story Even people who are not practicing Christians think they are familiar with the story of the nativity. Every Christmas displays of Baby Jesus resting in a manger decorate lawns and churchyards, and songs about shepherds and angels fill the air. Yet despite the abundance of these Christian references in popular culture, how many of us have examined the hard edges of this biblical story? In his new book Timothy Keller takes readers on an illuminating journey into the surprising background of the nativity. By understanding the message of hope and salvation within the Bible's account of Jesus' birth, readers will experience the redeeming power of God's grace in a deeper and more meaningful way. "[A] great gift book . . . Keller achieves his pastoral goal of teaching Christmas' most important message--'God alone has the life, truth, and joy that we lack and cannot generate ourselves'--and in doing so, provides solace for those who seek it." --Publishers Weekly Praise for Timothy Keller and his other books: "Superb . . . we should be grateful to Keller for his wisdom, scholarship, and humility." --The Gospel Coalition "Tim Keller's ministry in New York City is leading a generation of seekers and skeptics toward belief in God. I thank God for him." --Billy Graham "Unlike most suburban megachurches, much of Redeemer is remarkably traditional. What is not traditional is Dr. Keller's skill in speaking the language of his urbane audience. . . . Observing Dr. Keller's professorial pose on stage, it is easy to understand his appeal." --The New York Times "Fifty years from now, if evangelical Christians are widely known for their love of cities, their commitment to mercy and justice, and their love of their neighbors, Tim Keller will be remembered as a pioneer of the new urban Christians." Timothy Keller was born and raised in Pennsylvania and educated at Bucknell University, Gordon-Conwell Theological Seminary, and Westminster Theological Seminary. His first pastorate was in Hopewell, Virginia. In 1989 he started Redeemer Presbyterian Church in New York City with his wife, Kathy, and their three sons. Today, Redeemer has nearly six thousand regular Sunday attendees and has helped to start more than three hundred new churches around the world. He is the author of Making Sense of God, The Songs of Jesus, Preaching, Prayer, as well as The Meaning of Marriage, The Prodigal God, and The Reason for God, among others.